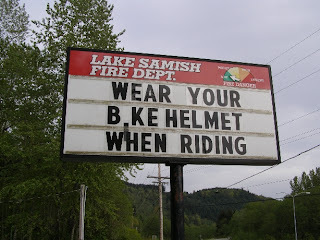 Along a popular road for bicycling, Lake Samish Fire District reminds folks to wear their helmets. Good idea. I've got mine. Oops, the "I" has dropped in bike. Also remember May is bicycle month with May 18 as Bike To Work and School Day. And, I say if you feel overwhelmed by "should dos" at work, bike away from work. Now there is a Study that says taking vacation cuts the risk of heart attack. Article says vacation is more of an enjoyable "should do" than not eating potato chips.